Temporary workers from the Military Production Ministry of the Egyptian government protest at Cabinet headquarters in Cairo Oct. 8, demanding permanent positions. Workers, farmers and women in Egypt continue taking advantage of greater opportunities to organize since the removal of President Hosni Mubarak by the Egyptian military on Feb. 11, 2011, after 18 days of popular protest against his repressive regime. Since ousting Mubarak, the military government has tried to stabilize capitalist rule and push back the popular movement by attacking demonstrations, arresting protest leaders and outlawing strikes. Egypt must go “back to normal life,” the military council says, “whatever the costs and sacrifices will be.” But strikes and protests continue. “The real difference since Mubarak’s removal is that people have woken up and will not be lulled back to sleep,” Gamal Abu’l Oula, director of the Center for Trade Union and Workers Services office in Mahalla El Kubra, said in a phone interview. Mahalla is a major textile center with a history of strikes and sit-ins. Egypt’s Awlad Al-Ard Foundation for Human Rights says there were nearly 1,000 labor protests, including strikes, sit-ins and demonstrations, from January to June last year. The English-language website for the Egyptian daily Al Masry Al Youm reports on more than a dozen labor battles in January. On Jan. 19 alone 450 workers from the Egyptian Maintenance Company, run by the government Petroleum Ministry, began a hunger strike in South Sinai demanding temporary workers be given permanent jobs. Workers at Ezz Steel Company in Sadat City protested for a third day demanding raises. 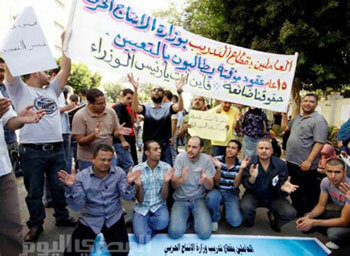 Workers at the Dar al-Tahrir Printing Press held a sit-down strike over back wages. More than 500 workers blocked Cairo’s Ring Road to protest their firing from the Dib Egypt Textile Company. A few days earlier, nearly 350 laid-off railroad workers blocked the tracks at the Cairo Railway Station demanding they be hired back as permanent workers. Hundreds of port workers in Alexandria demanded better health care and the removal of retired military officials from administrative posts. The independent unions are fighting for a new trade union law that would recognize their right to organize. The current law only recognizes the old federation. They are also demanding a higher minimum wage. Women have also taken advantage of the increased space Thousands of women and hundreds of men marched through downtown Cairo Dec. 20 to protest an attack by soldiers on women participating in a demonstration in Tahrir Square three days before. Participants were incensed by the beating of a woman whose clothing was torn off by soldiers, captured on video. “They are targeting women. They don’t want them to go to demonstrations,” Maie Sherefay, a university student and one of the marchers, said in a phone interview from Cairo. Sherefay said the reaction from male passersby was mixed. “Some were upset with us, some were laughing, but some responded and gave us a victory sign. Egyptian and foreign capitalists are concerned about the growing confidence and increased organization of working people in Egypt and worry that their profits could be threatened. Businessweek reported Dec. 25 that according to central bank figures, direct foreign investment was down 93 percent in the first nine months of 2011. The Muslim Brotherhood, which won a large plurality in the elections for parliament, has sought to assure local and foreign capitalists that it will be a responsible partner. And the ruling generals have made it clear that, whatever the parliament does, decisive power remains in the hands of the military, which itself owns factories, farms and real estate and is the largest single employer in Egypt. The Brotherhood seeks to curb the economic role of the military. “We believe in a very, very big role for the private sector,” Khairat El-shater, a central leader of the Islamist organization, told a group of 14 investment managers from the U.S., the U.K., Africa and the Middle East, according to Businessweek. The Brotherhood is dominated by capitalists who operate in sectors outside the military’s influence, including in consumer goods such as furniture and clothing. The Salafis, a more religiously conservative Islamist bourgeois opposition, won nearly 22 percent in the elections to take second place. Bourgeois liberal parties came in a distant third. Members of the Brotherhood joined the military’s Central Security Forces in blocking hundreds of protesters chanting “Down with military rule” from reaching the parliament building Jan. 31. The Brotherhood’s members chanted, “The army and the people are one hand,” reported Ahram, as they formed a human shield against the protesters. Georges Mehrabian contributed to this article.